This is a very cool variant of Munchkin, with a horror story theme. In many ways, it is just like Munchkin with a different theme, but there are some very important changes too. My favourite, is that classes have been replaced by powers, which the players aquire as they progress levels. This means that there is an actual feeling of developing a character, and not just adding more and better equipment to it. In my opinion, this is what Munchkin should have been from the start. 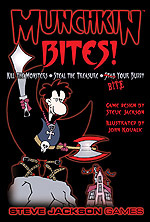 Interesting horror parody version of the Munchkin game. It's got alot of unique classes, items and monsters. It's blend of humour and horror game elements make it very enjoyable!